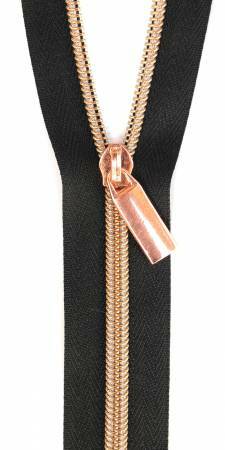 Sallie Tomato #5 Zippers by the Yard contain 3 Yards of Black Zipper Tape with Rose Gold Coil and 12 matching pulls. Coordinate the zipper tape color with your fabric and match the nylon coil color with your purse hardware! Easily cut and sew through the nylon teeth, while achieving the professional appearance of metal teeth. This size zipper is best used on the top of handbags, backpacks, totes, laptop carriers, and more!